The epidemic is having a catastrophic impact on families and communities and is placing tremendous strain on our health care system, businesses, and local and state governments. OUR MISSION: To use our united voices in a call for immediate, comprehensive and sustained Federal action to end the opioid addiction epidemic. OUR VISION: A world where opioids are prescribed cautiously and those with opioid addiction have easy access to effective treatment and recovery services. 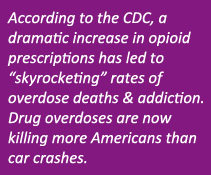 Prevent our children, friends, and loved ones from becoming addicted to opioids. Ensure that people suffering from opioid addiction have access to affordable, evidence-based treatment.